We get it, we’ve had typos in our stuff, too. Then, again, we’ve been compared to 12-year old boys living in our parents’ basements. 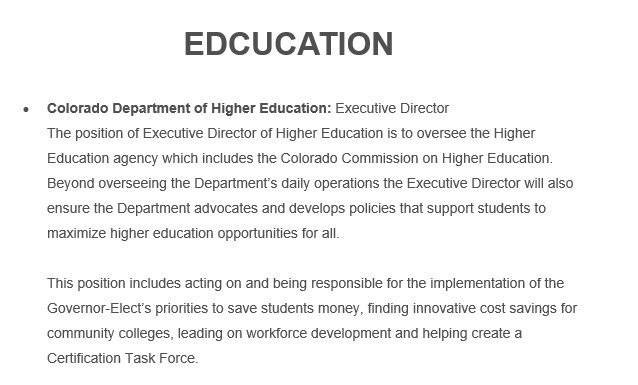 We’re not the Governor-elect of Colorado, whose team made a hilarious mistake recently by calling for applicants to state jobs in transportation, public safety, and “edcucation”. Surely, the computer that produced this listing had spell check or something similar. It’s not as if this was the correct spelling of a different word. It’s literally not a word. Regardless, the listing is proof that the Polis administration certainly needs help with education.